All bags for Yamaha Raider and Stratoliner motorcycle series are made with top quality Viking leather which ensures quality and durability for these products all the way. These all-weather bags will protect your valuables from rain and sun alike so you can now ride through any season and any time of the year without worrying about easy damage for your luggage. An advanced locking mechanism that is built into the system offers maximum security for all contents within. Now there are lesser chances of loss and theft when on the road, unlike before. Available in various shapes, the Yamaha Raider and Stratoliner bags are very portable with their easily detachable hardware options. 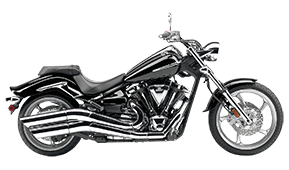 The premium design perfectly accentuates the look of the motorcycle and continue to look as good as new for years. This is possible due to the use of high quality Viking leather that is more durable and strong than other similar raw materials. Metal framing along the borders with ABS plastic reinforcing ensures a strong shape so that sagging does not happen. The hard metal back has the power to absorb road shock well so no matter how harsh the terrain is; the bags are not easily damaged. Every Yamaha Raider and Stratoliner motorcycle bag comes equipped with multiple pockets and pouches, inside and out. Some of these are zippered and air tight, protecting contents from all weather conditions as well as loss. Others are open and within easy reach of the rider for things needed all the time on the ride. They come in various shapes and sizes making organized storage an absolute reality for those who like to be on the road most of the time. Fitted with a complimentary hardware and instructions, these are easy to install. When you look at the amazing features and then the affordable price, you will know that no other similar product can offer such great value for money.